A football fan who travelled more than 5,000 miles to watch his favourite team has praised a regional daily’s coverage of the club. 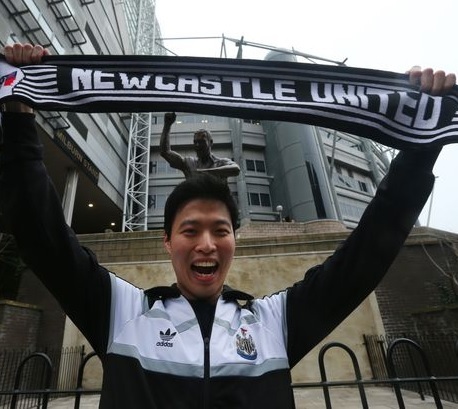 Jungmin Lee, below, follows Newcastle United from his home in Seoul, South Korea, and keeps up with the latest news on the team via ChronicleLive – the online arm of Newcastle-based dailies The Chronicle and The Journal. Mr Lee, who runs a Korean fan club called ‘Toon Korea’ and owns more than 20 black and white shirts in honour of the team’s colours, spent £800 on flights to watch United’s matches against Birmingham City, last Tuesday, and Rotherham United, on Saturday, at their St James’ Park home ground. The Chronicle tracked down the 30-year-old, who has followed the club from afar for around 12 years, and he gave particular praise to Chronicle chief sports writer Lee Ryder. He said: “When Newcastle were in the Premier League I would watch all the games. They are on TV at about 1am or 2am in the morning in Korea. Chronicle editor Darren Thwaites told HTFP: “It’s great to see how important our coverage is to Newcastle United fans across the world. We have more than 100,000 daily users of our NUFC coverage – enough to fill St James’ Park twice over. 100,000 daily users for NUFC coverage. That’ll raise a few quid – or perhaps even a fiver.